Hi all, it has been a busy few months for myself and others working with the fossil fish collections. You may have seen some updates on the @NHM_FossilFish twitter account that I have been away on fieldwork and at a couple of conferences, hopefully I will blog about these soon. One big event the whole Museum is involved in is happening this Friday, it's Science Uncovered! This is a Europe-wide event and is something nearly all the staff in the Museum are involved in. 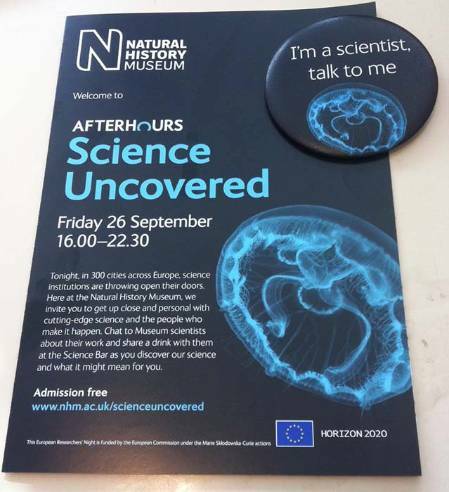 It is a free event with staff and volunteers talking about their research, favourite specimens and hot science topics. There is even a bar where you can come and talk to us over a drink. Team Fish will be out in force on the evening. Flyer and my 'I'm a scientist' badge. Look out for people wearing these during the evening. Dr Zerina Johanson and her team will be presenting new research on the evolution of the shark dentition, how this was built from individual teeth to form a highly functional feeding unit. Shark dentitions are very diverse, representing a wide range of feeding strategies. 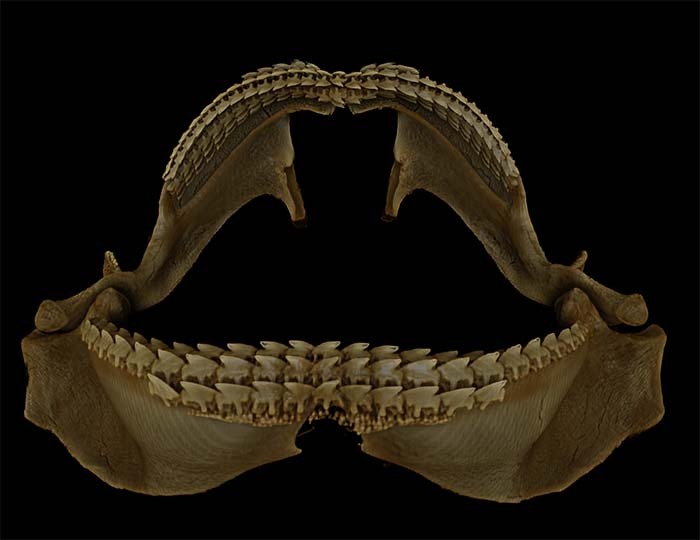 CT scan of the jaw of the shark Squalus acanthias. We will focus particularly on the sawshark dentition, with 'teeth' along an extended rostrum at the front of the head. These function during feeding (for example, slashing through schools of fish), but are they true teeth? Zerina will be in the Origins and Evolution Zone. Have you heard of oceans called 'Tethys' and 'Panthalassa'? Dr Martha Richter will be explaining how fossil fishes and cephalopods can provide clues about the palaeogeography and salinity of ancient oceans as well as the past connections between continents. She will illustrate this with exceptionally well-preserved fossils from two continents, Africa (Morocco) and South America (Brazil), which range in age from the Early and Late Cretaceous c. 100-90 million years ago. 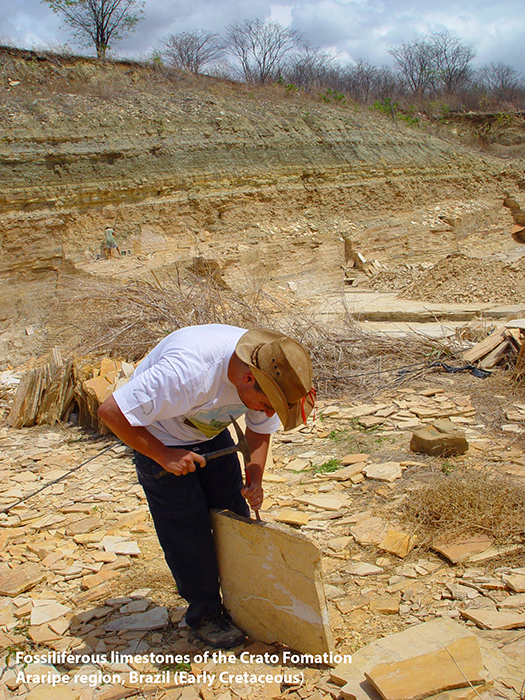 Excavating fossils in the Crato Formation, Brazil. Martha will be at Station 8: Oceans between 8:30pm and 10pm, in Marine Reptile Way. How do we know how big the biggest shark was when it is usually only their teeth that fossilise? Learn how to estimate the size of a shark from just their teeth and handle real specimens from Megalodon, one of the biggest sharks that ever lived, which could have swallowed a human whole. I will also be in the Origins and Evolution Zone. Myself holding one of the Megalodon teeth. Please do stop by and say hello to one or all of us. It promises to be a great night I hope to see you there! If you can't make it you can always follow events using the hashtag #SU2014.